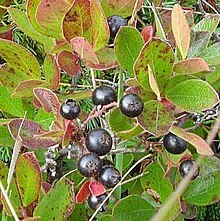 ^ a b c “Huckleberry”. The Oxford English Dictionary. 5. Oxford University Press. (1933). pp. H-434. ^ Steven Foster,Christopher Hobbs (April 2002). A Field Guide to Western Medicinal Plants and Herbs. Houghton Mifflin Harcourt. ISBN 039583807X. ^ a b “huckleberry”. ランダムハウス英和大辞典 第二版. 小学館. (1994). pp. 1306. ISBN 4095101016.